Whether it’s designing and making cars, shoes, art, fashion, furniture, or even loudspeakers, you can count on the Italian commitment to doing things with style. 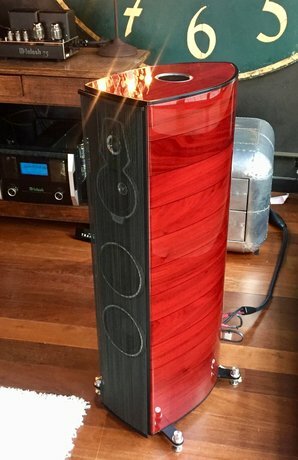 Such was the case at the Sonus faber world-premiere launch event February 2nd where a trio of gorgeous-looking and -sounding new loudspeakers was unveiled. Formally christened the Homage Tradition Collection, the new lineup largely builds upon the sonic and technical foundations of the existing Homage Collection and features gloriously striking, custom, real-wood cabinets with contrasting wood inlays and aluminum accents in a titanium finish. Offering equal measures of Sonus faber’s proprietary technologies for delivering high-end sonics and the design inspiration, aesthetics, and precision construction that draw on centuries-old Italian traditions of handcrafted musical instruments—the lute and the violin, in particular—the Homage Tradition Collection combines form and function beautifully.